Poor Lake Erie - it's the Great Lake with the saddest reputation. Declared "dead" decades ago, recipient of flaming waters from the Cuyahoga River, and infested with zebra mussels, Lake Erie has woes upon woes. Decades ago, the Clean Water Act helped Lake Erie regain some health by reducing point sources discharges, but then nonpoint souces, like stormwater and agricultural runoff caught up with it. Nutrient pollution has been increasing, and with it algae blooms that extend for miles along the shore. Lake Erie is also the source of drinking water for many communities, like the City of Toledo. ​Now, as reported by Tom Henry in the Toledo Blade, "Toledo voters have reached a consensus: Lake Erie — the world’s 11th largest lake and one that provides drinking water to 12 million U.S. and Canadian citizens — deserves to have its own bill of rights. In a special election that drew only about 9 percent of Toledo’s registered voters to the polls, the citizen-led Lake Erie Bill of Rights referendum passed by a 61-39 margin on Tuesday night, according to unofficial election results. Now, it’s up to lawyers to sort out what the citizenry’s impassioned plea for the lake really means in practice — that is, if it will be more of a symbolic gesture or, as its supporters claim, a new approach to planning and enforcement that will hold more polluters accountable." ​“Courts have routinely invalidated similar governmental overreaches across the country, including many backed by some of the same groups behind LEBOR [Lake Erie Bill of Rights],” the document states." 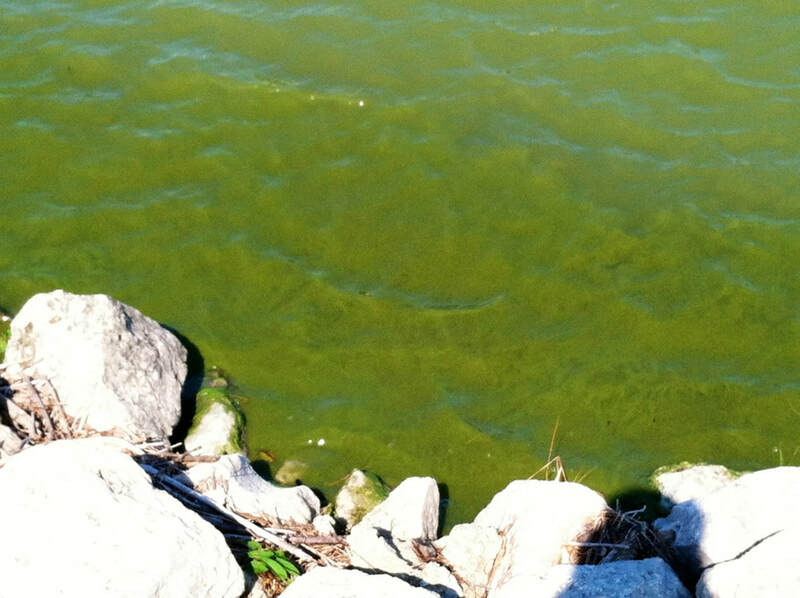 In 2014, the City of Toledo shut down it's water supply due to the presence of microcystins - a toxin produced by algae. A half-million people went three days without safe water, in the hottest time of the summer. According to the New York Times, this was the second city's water supply that was shut down because of Lake Erie algae. In September of 2013, Carroll Township, Ohio, had to shut off water to its residents as well. Despite the seriousness of these problems, Ohio did not designate Lake Erie as 'impaired' until 2018. New rules for fertilizer management were delayed by the Ohio legislature in the last days of the Kasich administration in December of 2018. Farm groups oppose the rules, which are seen as onerous and inflexible. Next month we will post a report here on the Ohio rules from the Midwest Cover Crops Council, including feedback from farmers, so watch this space! ​Click "Read More" for full text of the Lake Erie Bill of Rights. There are now 48 days left for the public to submit comments on the EPA and Corps of Engineers’ proposed rule to replace the 2015 Clean Water Rule with a new rule that would leave an estimated half of the nation's wetlands and about a fifth of our streams without Clean Water Act protections. This rule change will drastically reducing the scope of waters covered by the Clean Water Act. The 60-day comment period on the proposed rule ends on April 15, 2019. Read the proposed rule here. Note: The rule was originally released in December but the government shutdown delayed official publication in the Federal Register. The 60-day comment period began on February 14, 2019. LWV UMRR welcomes our member Leagues to work with us to submit comments. If your League would like to be part of this effort, email us at lwvumrr@lwvmn.org. Thanks! The Trump Administration last week released its proposed replacement "Waters of the United States" (WOTUS) rule, dramatically reducing the scope of waters protected by the Clean Water Act. If the proposed rule is finalized, many wetlands and streams will no longer be covered by the landmark 1972 law, leaving them vulnerable to pollution from mining, manufacturing, industrial agriculture, and other sources. Click here to read the proposed rule from the Army Corps of Engineers and EPA. Click here to listen to Circle of Blue's December 17 episode of "What's Up With Water?" about the proposed rule's definitions, history, and implications. Click here to read more from the EPA about the proposed rule. Illustration above from the EPA and Army of what would be included or excluded from Clean Water Act protections under the proposed revised definition of "Waters of the United States" (WOTUS). Traditionally Navigable Waters (TNG), perennial and intermittent tributaries, some lakes and ponds, some ditches, and wetlands directly adjacent to other included categories. Wetlands not directly adjacent to the above included categories - such wetlands are an estimated 51% of the nation's wetlands; ephemeral streams that flow only in response to rainfall and snowmelt, which make up an estimated 18% of the nation's streams, some ponds and lakes, some ditches, groundwater, stormwater, and wastewater. Jimmy Parra, lead Midwest Environmental Advocates (MEA) attorney on the challenge on behalf of petitioners ‘ challenging the diversion has stepped down as of yesterday, Jan. 18th. MEA’s Sarah Geers is replacing Jimmy while Tressie Kamp and Jodi Habush Sinykin remain on the case. MEA submitted a brief supporting the legal basis for contesting the diversion Dec. 17, 2018. Responses to that brief from DNR and parties supporting the diversion are due at the end of January. Our MEA attorneys then have the opportunity to respond to defendants’ briefs by March 4, 2019. The Admin. Law Judge (ALJJ, having read the arguments of both sides, will then make a determination given his reading of those arguments in light of WI law and precedent. At this time it appears that the ALJ may decide on the case by the end of June. Regardless of his decision, it is likely this case will go to the WI courts system, since one of the parties, either we petitioners or the WI DNR, will be disagree with the ALJ’s decision. MEA had filed a stay for diversion of water and withdrew it on October 17, 2018 because the City of Racine committed to not divert water before mid-2019. By that time, the ALJ is likely to render a decision. In June 2018 Louise Petering, Milwaukee-LWV began reaching out to State Leagues in the other 7 Great Lakes states to garner support for our petition before the ALJ and the Great Lakes themselves. Outreach efforts continued in July and August. By September it became clear that elections, changes in Exec. Directors and other factors demanded the attention of the state Leagues. Perhaps contributing to non-response from other Leagues may be the fact that all diversions since the Dec. 2008 effective date of the Great Lakes Compact have occurred in Wisconsin. The diversion issue is simply not on the radar of the Leagues in the other 7 Great Lakes states. During the summer of 2018, LWV Upper Mississippi River Region-Inter League (UMMR) and LWV IN did respond. UMRR’s board approved a statement supporting the petitioners’ initiative; LWV Indiana’s board approved of a letter petitioning their state representative to the Great Lakes Water Council (the governor or governor’s appointee) to file as an aggrieved party to the diversion. The idea of the latter was to move the challenge into the federal court system where a decision favorable to our case is more likely than in the WI court system. As of this writing the LWV IN has not received a response let alone action from the IN member of the Great Lakes Council regarding their request. As of Feb. 5, 2019, Louise Petering will roll out a pledge with WI members to support the DNR/Racine/Foxconn challenge and Great Lakes Compact. Louise is working with the LWV WI Exec. Dir. early next week to roll out the pledge to LWV Lk MI Region (MI, IL, IN) and the remaining 4 Great Lakes state LWVs (NY, PA, OH and MN) We want to do this in a timed fashion so we can track pledge # with respect to the date of the roll outs. They will also discuss asking Great Lakes state LWVs to consider pressing their representatives on the Great Lakes Water Council to file as an aggrieved party to the Racine diversion. Since all 4 diversions of Great Lakes water have occurred in WI, the diversion issue has not been an action priority for LWVs in OH, MI, PA & NY. We'd like all GL state LWVs to up the action on the permitted Racine diversion. On January 17, 2019 The Conference of Great Lakes St. Lawrence Governors and Premiers named its new leadership team. Wisconsin Governor Tony Evers will serve as Chair and Ohio Governor Mike DeWine will be Vice Chair. 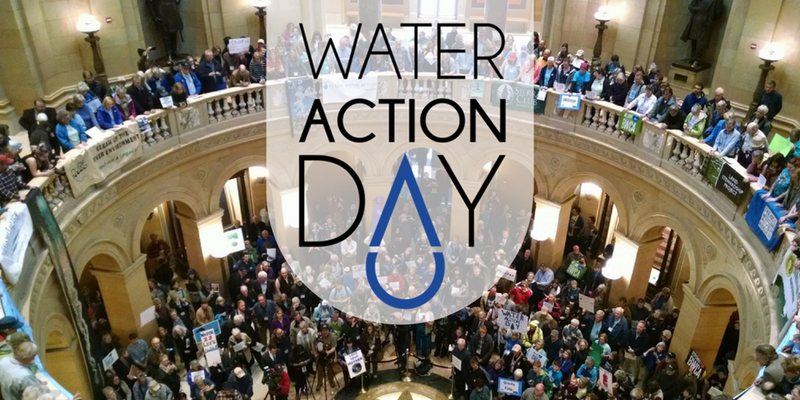 Minnesota's 2019 Water Action Day has been set for April 10. Last year, more than 700 people came to the State Capitol for this event. These citizen lobbyists took the message of water protection to their legislators through 145 legislative meetings, touching about 70% of the legislature. This all-day event includes free breakfast and briefings in the morning, both on how to actively engage legislators and on the water issues that we face in Minnesota. Throughout the day, attendees will meet with legislators to ask them to protect our water, and the Clean Water Rally will be held in the Capitol Rotunda at 2:00 pm. Register now at this link so meetings with your legislators can be set up! Bus transportation provided from multiple sites around Minnesota! The threats to Minnesota's waters are real this session - make your voice heard! 7-8:30 a.m., 8:30-l0:00 a.m., 10:00-1130 a.m., 11:30 – 1:00 p.m., and 3:30 – 4:30 p.m. Wait, what was that? Groundwater has been found to contain microplastics? Isn't that the fibers that come off our polyester clothes when we wash them? How would that get in groundwater? The video below, from the National Oceanic and Atmospheric Administration, explains WHAT microplastics are.... and lists some of the sources. As part of their work in sampling springs in northwestern Illinois, LWV Jo Daviess County (Galena) collected water samples from six springs in their area which were later tested for microplastic contamination. The results were published in the January 2019 edition of the journal Groundwater, and showed that microplastics are indeed getting into our groundwater. This article postulates that the source of the microplastics is septic tank effluent, based on analogous research into surface water contamination. Critics also note that Foxconn has a history of what some might call "bait and switch" - changing plans after commitments have been made. This is discussed in this February 3 segment of "Up Front with Mike Gousha" on WISN TV, Milwaukee. In this segment, Milwaukee Journal Sentinel business reporter Rick Romell says Foxconn has made plans for, and then abandoned, plants in Pennsylvania, Brazil and Vietnam. So, while the project may or may not be in a state of flux, the current lawsuit filed by Midwest Environmental Advocates will proceed. On February 1, Wisconsin Public Radio reported, “An environmental law center suing the state Department of Natural Resources over the decision to divert water to Foxconn Technology Group for its manufacturing plant says the company's change of plans should put the water diversion on hold. Midwest Environmental Advocates in May challenged the DNR's approval of a city of Racine request to divert 7 million gallons of water per day outside the Great Lakes Basin. Sarah Geers, an attorney with the group, said the reason that Foxconn needed so much water was to manufacture LCD screens. … "Plans for the site have changed in fundamental ways since this project was first pitched to the public," Geers said. "In light of these dramatic changes, we are carefully evaluating how Foxconn’s new plans affect the city of Racine’s planned diversion of Great Lakes water." Around the LWV UMRR region, confined animal feeding operations (CAFOs) are increasing in number steadily. The demand for animal products, pork, beef, chicken, dairy products, has lead to this growth. In Iowa, there are about seven hogs in confinements for every person. The hogs are raised in barns with large manure pits. Their waste, equivalent to that produced a small city, is land applied as fertilizer on the fields where corn for the hogs is grown. This raises concerns about odors, drinking water contamination and polluted runoff that affects surface waters. filed by environmental groups Iowa Citizens for Community Improvement and Food & Water Watch was denied. Attempts to pass legislation in the 2018 legislature also failed, and the debates go on. Critics note more than 97 percent of proposed facilities are approved, often over objections of neighbors and counties voicing environmental concerns. According to the Milwaukee Journal Sentinel, in Wisconsin, the number of CAFOs has grown by 400% from 50 in 2000 to 252 in 2016, agency figures show. This has played a key role in growing milk production as farm numbers fall. The dairies are very different from the small dairies of earlier times. The video below, from the Milwaukee Journal Sentinel online, describes a modern dairy operation in Kewaukee County with 6500 cows. The rapid growth of very large CAFOs has been complicated by state rules that were written at an earlier time. In 2017, the Dairy Business Association sued the Wisconsin DNR, saying that the DNR did not have authority to regulate CAFOs as they were doing. This suit was resolved in an agreement that was negotiated between the WI DNR and the Dairy Business Association. ​The November 2017 settlement agreement limited DNR’s authority to protect water quality through the science-based application of state law intended to prevent pollution from Wisconsin’s largest concentrated livestock feeding operations. This was very concerning, as many felt that more regulation of CAFOs was needed now, not less. Four environmental advocacy groups—Clean Water Action Council of Northeast Wisconsin, Friends of the Central Sands, Milwaukee Riverkeeper and the Wisconsin Wildlife Federation—challenged the settlement on the basis that the agreement, negotiated behind closed doors, changed DNR pollution permitting policies and rules without going through the official rulemaking process. ​ A January 11 ruling by Milwaukee County Circuit Court Judge William Pocan is being heralded by clean water groups as a win for public health and transparent government. Judge Pocan sided with the environmental groups represented by Midwest Environmental Advocates when he ruled that an agreement between the Wisconsin Department of Natural Resources and the State’s largest dairy business lobby violated state law. The decision is an affirmation of DNR's authority to protect water quality through the science-based application of state law intended to prevent pollution from Wisconsin’s largest concentrated livestock feeding operations. UPDATE - JANUARY 18, 2019 - Wisconsin Supreme Court asked to rule on WI DNR authority to regulate agribusiness - click here. Minnesota is the headwaters of three major North American waters basins - the Red River of the North basin, the St. Lawrence/Great Lakes basin and the Mississippi basin. To unite planning from cities, counties and watersheds, Minnesota has initiated a One Watershed, One Plan test project. Begun in 2011, five watersheds now have approved plans and 22 more of the state's 89 watersheds are in the works now. This story, from the Park Rapids Enterprise, describes the tribulations that one county is going through as it wrestles with the issues involved in adopting and implementing their part of the One Watershed plan for the Leech River. The Leech River runs through Hubbard County, entering the very-young Mississippi at Leech Lake. To read more about Minnesota's One Watershed One Plan program, click here. By Shannon Geisen on Dec 22, 2018 at 4:00 p.m.
On Tuesday (Dec 18, 2018), the Hubbard County Board terminated its memorandum of agreement to develop a Leech Lake River One Watershed, One Plan. Since September 2017, the county has partnered with Cass County, Cass County Soil and Water Conservation District as well as the Hubbard County Soil and Water Conservation District (SWCD) to develop a 10-year comprehensive management plan for the shared watershed. According to the Minnesota Board of Water and Soil Resources (BWSR), the goal of the One Watershed, One Plan (1W1P) program is for local governments to combine information from their existing water plans, data and information from state water agencies, and input from federal agencies, nonprofit organizations and citizen stakeholders. The board's Dec. 18 resolution states "the Hubbard County Board of Commissioners has determined that further participation in the agreement is not in the best interests of the county or its residents." County commissioner Char Christenson said, based upon county attorney Jonathan Frieden's advice at a Dec. 11 county board work session, "if we do not terminate this, we are automatically then committed." "That's somewhat different than what it was originally," added county commissioner Ed Smith. County commissioner Vern Massie said he has opposed the project from the beginning "because I said it was going to be a money pit and that's what it turned out to be." "We're all finding that out, and this is just to kind of clean it up," said board chair Cal Johannsen, adding "if the new board wants to do something different, they can." Massie and Smith lost their bid for re-election to David De La Hunt and Tom Krueger, respectively. Ted Van Kempen replaces Johannsen, who is retiring. "It's just a bureaucracy. It's like the blob, just moving down the street," Massie said. Termination of the agreement was news to Hubbard SWCD Manager Julie Kingsley and SWCD Board of Supervisors Chair Lynn Goodrich. They have been part of the planning process since 2017. Neither was invited to the work session or Tuesday's board meeting, they said. "The Hubbard County Board termination of the Leech Lake River Comprehensive Water Management Plan memorandum of agreement should be a major concern to the residents of Hubbard County," says Kingsley. "How does the county hope to maintain the water quality we now have if priorities aren't set and strategies and actions aren't taken to at least maintain and protect the main economic drivers in Hubbard County — our lakes, rivers, streams, forests and groundwater?" The Leech Lake River watershed is unique in both its pristine nature as well as the potential level of development, which can diminish water quality. The watershed has 854,659 forested acres, 277 river miles, and over 750 lakes. Major threats to the watershed include the loss of shoreline and aquatic habitat, population growth of up to 60 percent by 2030, increased pollution, and loss of biodiversity due to the expansion of invasive species. Sixty-one priority lakes were identified for protection, along with the Necktie River, Bungashing Creek, and the Kabekona River. The One Watershed, One Plan planning process has been entirely voluntary, Kingsley added. "This is a plan. Neither county has any financial obligations in any way toward the planning process." Last week, a draft of the 355-page Leech Lake River Comprehensive Watershed Management Plan was made available for public review at www.co.cass.mn.us/LLR1W1P. Comments may be sent to Kelly Condiff at 218-547-7246 or kelly.condiff@co.cass.mn.us by Jan. 14, 2019. A public hearing is scheduled for 9 a.m. Friday, Feb. 15 at the Cass County board room in Walker. The BWSR Northern Region Committee will then review all comments. In March, the BSWR Board is expected to approve the plan, then there is a 120-day window for local counties to adopt the plan. Goodrich noted that Smith has represented Hubbard County at two recent meetings, "where he failed to voice any concerns about the plan that the commissioners might have discussed. We, along with BSWR representatives, have volunteered throughout this process to come to their meetings and answer any of their questions about the plan and process. The planning process has involved a great number of people representing various groups, agencies, local units of government, Native Americans — each giving freely of their time and talent to ensure the Leech Lake River 1W1P was well thought out and comprehensive," he said. All representatives were involved in the budgeting process and all budgeted items were covered by a BSWR grant, Kingsley noted. "Hubbard County had no financial obligations for this part of the plan." "I must say I am sadly disappointed in the Hubbard County Board decision and resolution to withdraw from the Leech Lake River Comprehensive Watershed Management Plan at this stage of the game," she continued. "It is foolish and a waste of time, talent and goodwill for Hubbard County to withdraw at this time and not see this portion of the plan completed." 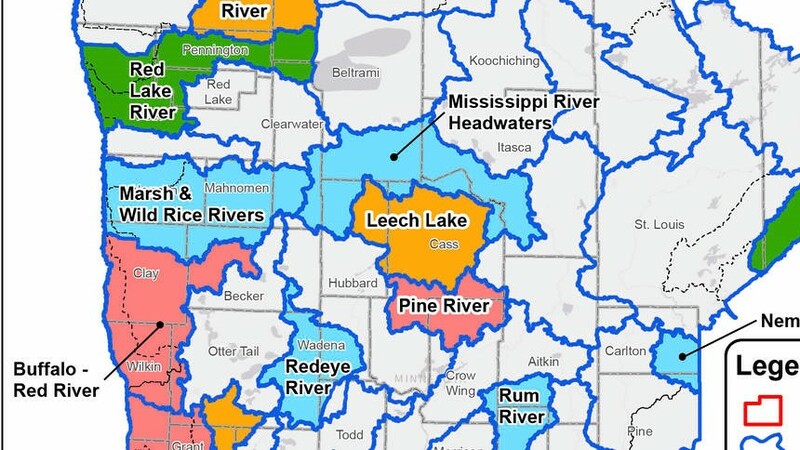 If Cass or Hubbard counties adopt the Leech Lake River 1W1P by Sept. 27, 2019, "that does not mean that they are locked into the implementation phase," Kingsley said. While it is a BSWR program, "counties have the final say on decisions." Goodrich explained, "It is our plan only if and when we choose to adopt it. We control it." If the county decided to move to the next phase, a new memorandum of agreement between the partners would be written, Kingsley explained. She emphasized that implementation of the Leech Lake River 1W1P is a protection plan, unlike other watersheds, like in southern Minnesota, where expensive, site-specific restoration is needed. The Leech Lake River 1W1P is a protection strategy, she said. Goodrich agreed. "Implementation is a very different thing here in the Up North country, as we have possibly the best waters in Minnesota and we are merely try to ensure they continue to be. We are exporters of water to the rest of the state." There are larger implications for the County if they do not complete the Comprehensive Watershed Management Plan, Kingsley added. "The county would then have to revert back to the Local Water Management Plan, which covers just Hubbard County and does not take the broader view of the three major watersheds in the county." The local plan will be due for its five-year review in 2020. "If the county does not update the local water management plan, then funding from BWSR's Natural Resources Block Grant would be defunded. This funds the county's septic systems treatment upgrade program and shoreland ordinance," she said. In August, BWSR approved a planning grant for the Mississippi River Headwaters One Watershed, One Plan. This watershed includes parts of Beltrami, Cass, Clearwater, Hubbard, and Itasca counties. To date, the Hubbard County Board has only given a verbal agreement to participate in this watershed plan. The following content is from Ann Journey's January Soil Health Update. Ann is Minnesota's Soil Health Coordinator with the NRCS -ACES program (read about the ACES program ﻿here﻿). Thanks to Ann for permission to share this information on the LWV UMRR Blog! As corks were popping, credit card companies started to send the happy missives detailing how far over budget we went last month. We already knew amounts due could shock. Mastercard SpendingPulse reported on Boxing Day that holiday spending from November 1 to December 24 topped $850 billion, up 5.1% from 2017, despite bad weather on key shopping days. Eleven zeroes are hard to digest, so per capita perspective helps. The Census Bureau pegged the US population at 328,192,898 on Christmas Eve, resulting in a more relatable $2,590 each. Wait—weren’t we expected to spend $885? Yes, on gifts. Toss in extras like food and home improvement, and we bent the plastic. With an average APR of 17.21%, motivation to pay the balance ASAP is self-evident. But, as we know after a few days of sit-ups, kale, earlier bedtimes or any of the other top 10 resolutions, good intentions rarely suffice. In 2017, Americans incurred a mean $1,054 in holiday credit card debt. Nearly 80% of respondents to a year-end survey said they’d need three or more months to resolve it; 10% expected to make minimum payments only. Before 2018’s last spree, 32% of loyalty-program respondents planned to PAYGO, while another 32% predicted pay-off within three months. Will those plans hold once the bills arrive? We live in the Age of Debt. The National Debt approaches $22 trillion (total public debt outstanding). The Census Bureau tallied state debt at $1.2 trillion in 2016 (most recent data), which balloons to $5 trillion if underfunded pensions are included; local governments owed $1.8 trillion. US corporations carried $9.1 trillion by mid-2018, a 46% increase since 2007 and a higher fraction of GDP than the previous record, set at the nadir of the Great Recession. US households have also binge-borrowed, racking up $13.5 trillion by the end of September, $420 billion of which revolved month-to-month on credit cards. Total credit card debt stood at $944 billion, just below last year’s $1 trillion high. Nor is the US alone; the world collectively owes almost $250 trillion, 89% of its 2017 total wealth. But debt—which Merriam-Webster defines as “sin,” “obligation” and “a state of owing”—is fungible. It can be a burden or a tool. Its terms are subject to negotiation. A debt of scale can even be absolved, hence “too big to fail.” Monetary debt is therefore fuzzy; it carries a whiff of the unreal. (Don’t try to tell that to your lender!) Humanity, however, has accumulated a real, growing debt, one measured in carbon and payable to a banker not known for leniency. The bills are marked “Second Notice.” The top 2 meters of Earth’s soils have lost an estimated 116 billion metric tons of organic carbon since organized agriculture began 12,000 years ago, and cumulative SOC loss is rising in hockey-stick fashion as agricultural land use increases. Two-thirds of it may have gone into the atmosphere, where we least want it. This soil carbon debt has also been identified as the potential soil carbon sink capacity, becoming a central element of climate change mitigation. A sink that could swallow three years of CO2 emissions (all sources) can’t be ignored. Unfortunately, its attainable size likely tops out between 50 and 66% of its potential due to physical, chemical and biological constraints, and its feasible size could be lower still. This is where humans re-enter. On one side, among others, is the 4 Per 1000 Initiative, an organization aiming to ”demonstrate that agriculture, and in particular agricultural soils can play a crucial role where food security and climate change are concerned.” Based on the calculation that a 0.4% annual rise in SOC would “halt the increase in the CO2 concentration in the atmosphere related to human activities,” 4 per 1000 “invites all partners to state or implement some practical actions on soil carbon storage and the type of practices to achieve this (e.g. agroecology, agroforestry, conservation agriculture, landscape management, etc. ).” On the other side sits every economic, technological, legal, social, political and logistical hurdle supporting the status quo, be it affirmatively, pragmatically or from a growing sense of futility. Asking farmers, foresters and other producers to realign their enterprises to the 0.4% goal is difficult without a means to value soil carbon. Change carries up-front costs. What’s SOC worth? Governments may not be able to incentivize at this scale, so how do we create a viable market for sequestered carbon? And should agriculture be under the responsibility microscope alone? City-dwellers use land and drive agricultural demand. We dug the carbon debt-pit together; digging out must also be a joint effort. Finally, while we’re thinking globally, take a moment to appreciate Bill Anders’ photo. There’s plenty of dirt in the foreground. Soil, biologically speaking, is restricted to the lovely blue orb in the background. Those who remember December 24, 1968 may recall the sense of awe this image generated, and the not-so-subtle dread that accompanied it. The Earth looked so tiny, so vulnerable…. In the fifty years since, humans have trod on lunar dirt six times, the last in December 1972. The Dark Side has now been reached, but lunar dirt is likely to remain just that for the foreseeable future. Terraforming is a heavy lift, even under a dense atmosphere, which the Moon lacks. Just ask the uncountable microorganisms who did it the first time, here. Soil health to lessen our carbon debt, lest the Earth foreclose upon it. There is no Planet B! Click READ MORE for lots of information on many upcoming soil health events in our region! LWV Upper Mississippi River Region ... in these blog posts we talk about what we do, where we go, our events, our beliefs. But what is the LWV Upper Mississippi River Region, anyhow? Comprised of about 50 local Leagues across the Upper Mississippi watershed, we have a broad network and many interrelated issues to address. Our program of action - the things we work on - is set every year at our Annual Meeting with approval from our membership. Since our incorporation on October 25, 2015, we have been focused on working to reduce the amount of nutrients - fertilizers and wastes - that are discharged to the Mississippi. In our four states, this work takes different forms. In Minnesota, our members advocate for stronger groundwater protections, help plan a major water-related lobbying day at the Capitol, and are working with other organizations to hold workshops for absentee owners of farmland. We learn about and take positions on water issues, such as when we joined with LWV Wisconsin to speak out against the diversion of water from Lake Michigan. And we work to shine a light on issues of groundwater depletion and pollution in parts of Wisconsin and Minnesota. In Illinois, LWV Jo Daviess County (Galena) has been leading efforts to develop local water plans and protections, and organize monitoring efforts to document water quality in the Galena River as well as local groundwater. They have worked with the Rotary Clubs in the Midwest to educate and activate people on issues of nutrient pollution, and have received awards for their work. Our Board meets on the first Monday of even-numbered months. We travel around the watershed, putting on events with local Leagues as part of our Board meetings. Here are some examples from December and October of 2018. When possible, we video our educational events and share the videos on our blog. Our Annual Meetings are big events, with speakers and more. In 2018, we were in Chicago for a joint meeting on LWV water work nationwide with LWV Lake Michigan; our 2017 Annual Meeting was in La Crosse and focused on water issues in Wisconsin. Who we are, what we do, is built upon our strong foundation from LWV at all levels. The following statement was written by one of the founders of LWV UMRR, Bonnie Cox of LWV Jo Daviess County (Illinois). Bonnie's statement is inspirational, and provides a guiding light as we work our issues. We thank Bonnie for her work with UMRR! Our blog posts document our work - here's a list of the posts as of December, 2018. 9/11/2018 Watershed Action - We're all in it Together! 3/6/2018 Water: Advocating for Protection - Put your League on the Map! June 27, 2018 in Chicago - Join us! 12/6/2017 LWV Jo Daviess recognized in a big way for their water quality work! 6/20/2017 Citizen Voices Matter - Especially Now! 6/18/2017 Make a Difference - Fight to Win! 12/7/2016 Water - We're all in the Same Boat! 8/29/2016 Galena in the autumn, great place for Watershed Game training!